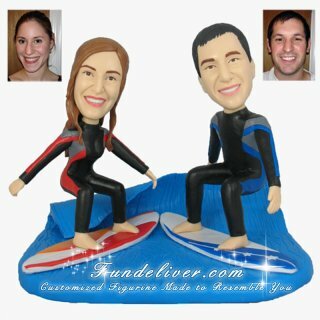 This is a completely customized surfer theme wedding cake topper. Catch a wave...with a wedding cake topper for a surfer! Send us your images of favorite surfing boards or surfing wetsuits, we can replicate them to add a special touch on your surfing theme wedding. Perhaps you and your fiance/fiancee met in one of those surfing theme Wedding.